This Candidate Journey Map & Content Planner Template will help you understand and document the key stages in the candidate journey for the top personas that you’re recruiting, and then help you plan out what content you need at each stage to attract, engage and convert candidates into new hires. Includes instructions and examples, and allows full customization to your candidate journey stages. Available in PowerPoint and PDF. Each stage of the candidate journey is an opportunity to influence talent with engaging recruiting content. The secret is knowing what questions candidates have and the information they seek along the way that will move them from attraction to new hire. This Candidate Journey Map & Content Planner Template will help you understand and document the key stages in the candidate journey for the top personas that you are recruiting, and then help you plan out what content you need at each stage to attract, engage and convert candidates into new hires. The Rally Recruitment Marketing Template, sponsored by Alongside and Glassdoor, is free to use and yours to customize! Available in Microsoft PowerPoint and Adobe PDF. The first template, Candidate Journey Map, walks you through documenting each stage of the candidate journey for your top candidate personas, including the persona’s needs, activities, expectations and questions during their journey. In addition, the template lets you indicate whether the persona’s candidate experience during each stage is positive, neutral or negative, so that you can understand how that may impact the candidate journey. The second template, Content Planner, allows you to go into more detail about the content assets that you will create and provide to the persona during each stage of their candidate journey. You can map out what content you need, which channels you’ll use, how the content answers the candidate’s questions, what is the call to action, and needed resources to implement your content plan. 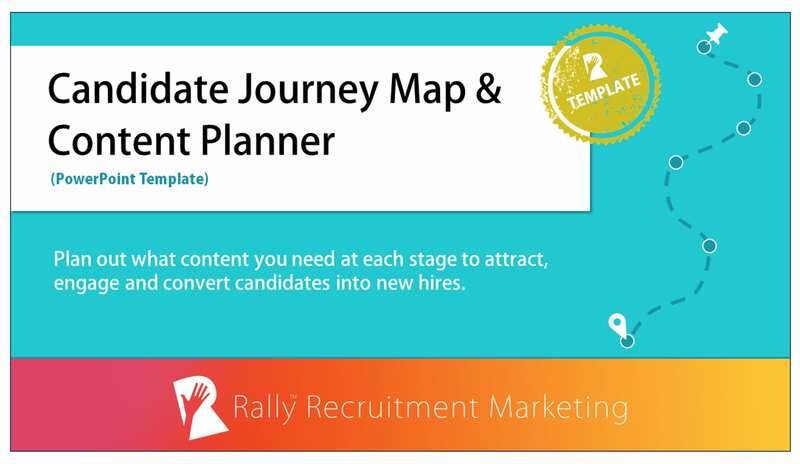 Download your copy of the Rally Recruitment Marketing Template: Candidate Journey Map & Content Planner today. Alongside and Glassdoor are sponsors of Rally. Their sponsorship fee helps us to create educational content and events on Recruitment Marketing.